Gurdwara Panja Sahib (ਗੁਰੂਦਵਾਰਾ ਪੰਜਾ ਸਾਹਿਬ) is a gurdwara situated at Hasan Abdal, 48 kilometres (30 mi) from Rawalpindi in Pakistan.This is one of the most holy places of Sikhism because it marks the spot where the founder of the faith, Guru Nanak Dev JI visited and instilled an important lesson for his adherents. Still visible is the sacred rock with the hand print of Guru Nanak Dev JI .Many thousands of faithful Sikhs from all over the globe visit this shrine. 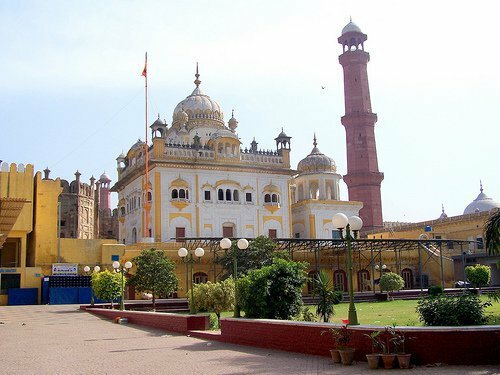 However, twice a year, during special celebrations, an enormous number of Sikh pilgrims attend this Gurdwara from every corner of the world. The word “Panja” in Punjabi means an “outstretched palm” from the word “panj” which means “five”. Guru Nanak Dev Ji along with Bhai Mardana Ji reached Hasan Abdal in Baisakh Samwat 1578 B.K. corresponding to 1521 ACE in the summer season. Under a shady cool tree, Guru Nanak Dev JI and Bhai Mardana started reciting Kirtan and their devotees gathered around. This annoyed a local saint, Hazrat Shah Wali Qandhari, who meditated atop a nearby hill but he was helpless. The Guru put aside a big rock lying nearby and a pure fountain of water sprang up and began to flow endlessly. Bhai Mardana quenched his thirst and felt grateful to the Guru. On the other hand, the fountain of Shah Wali Qandhari dried up. On witnessing this, the Wali in his rage threw a part of a mountain towards the Guru from the top of the hill. The Guru stopped the hurled rock with his hand leaving his hand print in the rock. Observing that miracle, Wali became the Guru’s devotee. This holy and revered place was named Panja Sahib by Hari Singh Nalwa, the most famous general of the Kingdom of the Sikhs. He is credited with having built the first gurdwara at this place.